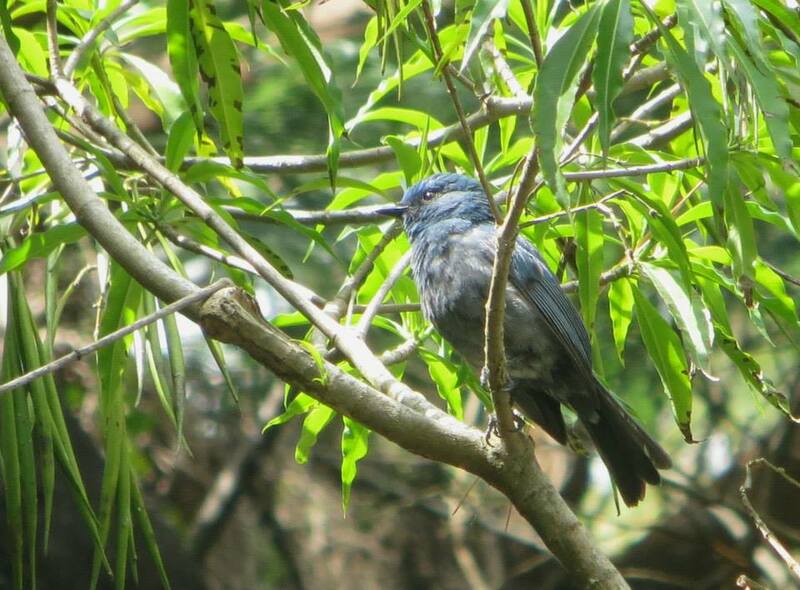 I have seen the Nilgiri Flycatcher only in pairs; several times in different parts of Tamil Nadu and Kerala. Never though has the male or the female shown up solo to enthrall me. The male always seems to first arrive, barring his fluffy indigo blue breast, violet hair gel and long tail-feathers with a smattering of pale-white. He suspiciously, but with élan, tilts his head sideways as if to say “what business do we have together for you to find it appropriate to disturb me during my meal, good sir?” As I arc the camera lens towards him, he quickly disappears behind prickly bushes. Seconds later, his lover drops by, with a song in her breath and doubt in her shadowy eyes. Every time she sings “epp epp epp”, she looks more intently at me. And the mosaic of colours – grey and blue – in her plumage glistens in the sun’s spittle. She then gracefully looks away, angling her dark-brown beak, as if to wonder what force in this blue planet would make me leave her and the anxious lover in peace. And I smile, trying to make sense of whatever brought them, and their love, to me. Flycatchers, with a tinge of blue, have been my nemesis in bird identification. I always mix them up with each other. For instance, the Tickell’s Blue Flycatcher with the Blue-Throated Flycatcher. The Verditer Flycatcher with the White-Bellied Blue one. And the Nilgiri Flycatcher with the previous two. Due apologies if I got them confused again in these photographs. I share your feeling for birds, like there is a deeper level of understanding with them. People have a tendency of boxing each other in, with nice little labels and idiosyncrasies categorizing each other before we even get an opportunity to really KNOW one another, frustrating sometimes, with my own species. PS — Kids loved the video of the flycatcher. ‘Awwwws’ all around here. Such a pretty girl. Frustrating indeed comrade, very well put! You must know that i gorge on your (and your family’s) connections with birds too and so very glad I could provide the link to awwws, joy and cheers! Thanks Marcus, appreciate that. Ah yes thr colours, it’s all been very kaleidoscopic thus far! Is it okay if I come and ‘like’ this one again? He may be more stunning than our cardinal. Or at least AS stunning, in a different color. Hope you’re having a fantastic summer, Christy. Oh Shannon, you are welcome to pepper any post how many ever times you see fit, more the merrier I say. Definitely only as stunning. The cardinal’s crest though is unmatchable! Summer has been both sheepish and sultry, not a very good one. But on its last legs now, and I hope for a much nicer few months. You should know that I’ve got a cardinal coming in my next post. They are pretty stunning! Pretty, stunning and and and…oh shucks we know! ❤ Can’t wait, shannon. I wish I could go out birding with you. So much beauty! And you could pen a haiku about every bird you spot (smile). So very much this beauty, J.
Don’t be sorry about birdy inclinations ever! At least not here. It looks like that cute and fluffy bird from Rio (not the Macaw :P). Aww thanks Archie, she is an absolute doll, cartoon character sounds just about right too! Awww if it was a blue flycatcher, it must have been a blue-throated or an ultramarine flycatcher (found in your area)! The Nilgiri fellas are endemic to Western Ghats I think. Have you emailed it to me? Yaaay will check it out sushi! Just saw the photos. 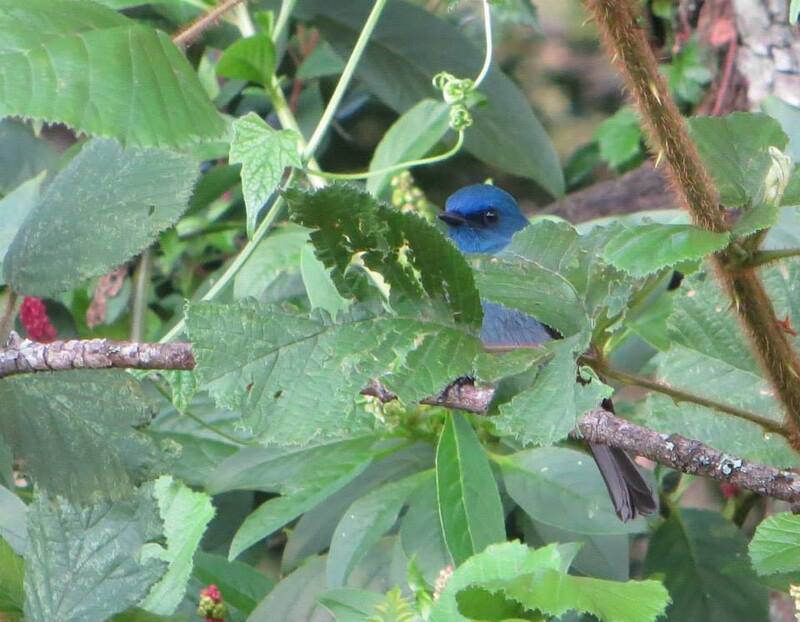 You have spotted and photographed a Blue-Throated Blue Flycatcher couple (huge smile).